L'Authentique 500 g Elaboration of authentic red wines that faithfully express prestigious terroirs. Making aromatic white and rosé wines. Elaboration of white wines that express prestigious terroirs. Elaboration of aromatic white and rosé wines. La Marquise 500 g Elaboration of sparkling wines. Elaboration of floral white and rosé wines. La Raffinée 500 g Elaboration of fruity and complex red wines. Smooth fermentations which respects the expression of the grape variety. Production of aromatic white and rosé wines. Levure So Flavour 500 g Production of intense, complex and fruity red wines. Levure So Fruity 500 g Elaboration of fresh and fruity red wines. Pure strain of Torulaspora Delbrueckii to be used in combination with Saccharomyces Cerevisiae strain(s) or alone for low alcohol products (<6% alc./vol.). Produces mannoproteins and polysaccharides for a rounder mouthfeel. Optimal blend of Saccharomyces Cerevisiae, Torulaspora Delbrueckii and Kluyveromyces Thermotolerans which increases mouth-feel. Nuances of complexity and fruit. For bigger format, please ask us ! 5 Kg Thiamin and Ammonium sulfate. Basic yeast growth medium. Activateur Boland 1 Kg Diammonium phosphate and thiamin. Based nitrogen nutrient formulated for second alcoholic fermentation. Custom order 500 g Yeast hulls (an exclusive Oenofrance process), ammonium nitrogen, thiamin. A full and nutritionally balanced fermenting medium. Custom order 1 Kg Yeast autolysates, nitrogen from inactivated yeast, amino acids, yeast cell envelopes. GMO-free, non-allergenic. Nutrient for the optimization of aroma production during alcoholic fermentation. New! 1 Kg Yeast autolysates, nitrogen from inactivated yeast, amino acids, yeast cell envelopes. GMO-free, non-allergenic. Nutrient that promotes the production of aromas by yeasts. Complex nutrient to start the alcoholic fermentation. Vivactiv Premier 1 Kg Yeast autolysates, nitrogen from inactivated yeast, amino acid, thiamin. GMO-free, non-allergenic. Nutrient to manage the alcoholic fermentation efficiently. 5 Kg Yeast products rich in parietal polysaccharides. Elaboration of round red wines with more volume and protect the color. Custom order 1 Kg Inactivated dry yeasts rich in reducer elements. Protecting and preserving color and aromas of white and rosé wines. Phylia Cys 1 Kg Yeast product whith a stronger reducing potential. Against oxidation of white and rosé wines. New! 500 g Yeast protein extract. Gentle wine fining. Brand new way of fining with no gelatin or silica-gel. Phylia Exel 500 g Fully soluble polysaccharides and yeast proteins. Tartrate stabilization and fining of wine. Refine wines just before bottling. 100% soluble. Phylia LF 500 g Yeast product rich in mannoproteins. Safe and natural wine aging. Lees substitute. Custom order 500 g Yeast hulls. Preventive or curative treatment, improve alcoholic fermentation. Custom order 5 Kg Plant proteins and bentonites. Preventive treatment of white and rosé musts against oxidation and protein instability. 5 Kg PVPP, microcrystalline cellulose, ligand. Adsorbs the oxidizable and oxidized tannins, removes bitter or harsh flavors and prepares to the clarification. 5 Kg Vegetal-based protein, allergen free and without casein. PVPP, Bentonite, cellulose. Preventive and curative treatment of white and rosé musts and wines against oxidation. New! 1 Kg Selected pea proteins. Clarification and oxidation treatment of must. 20 Kg Bentonite and Casein. Prevents to the oxidation and increases the heat stability of white and rosé wines. 5 Kg Bentonite and PVPP. Developed for preservation of rosé wines’ colour. It also prevents the pinking of white wines. 5 Kg Bentonite, PVPP and a specific enological tannin. Detoxification, fading and de-proteinization of rosé musts. 1 - 4 g/hL For the devatting, clarification and flotation of white musts. Lysis Couleur 100 g 2 - 5 g/100kg Microgranular enzymatic preparation used for extracting and stabilizing the color of red wines. 2 - 4 g/hL Microgranular enzymatic preparation used to go with the aging of great wines. 3 - 4 mL/hL Liquid enzymatic preparation for clarifying and settling difficult juices. 2 - 4 g/hL Concentrated microgranular enzymatic preparation for expressing aromas. rich in harsh and bitter tannins. Custom order 100 g 2 - 5 g/hL Pectolytic enzyme for the clarification of red juices or red wines. pressing or naturally rich in polysaccharides juices. Lysis SR 100 g 3 - 4 mL/hL Liquid enzyme preparation for the clarification and racking of rosé musts. 0,3 - 1 mL/hL Very concentrated liquid enzymatic preparation used at low doses for devatting white musts. Custom order 500 g 5 - 10 g/hL Pectolytic enzyme preparation for the release of terpenic aromas in wines. 2 - 4 mL/hL Liquid pectolytic enzyme preparation for must flotation. 5 - 10 mL/hL Specific enzyme preparation for clarification and filtration of musts and wine. thus the quality of musts coming from skin maceration. Custom order 500 g 2 - 5 g/hL Pectolytic enzyme for the clarification of red juices and red wines. Viniflora®CH11 For 25 hL High fermentation speed, outstanding tolerance to lower pH (3.0), lower temperature and higher levels of alcohols. SO2 sensitive. The fastest. For 25 hL Outstanding tolerance to high alcohol levels, clean and classic flavor profile. Ideal for red wines with a pH > 3.4. For 25 hL Outstanding tolerance to lower pH (3.1) and higher SO2 levels. Clean and fruity flavor profile. Viniflora®CiNe For 25 hL Keep the fruit intensity and create new wine styles with this unique diacetyl-free malolactic culture. Mostly for whites and rosés. 1 Kg Diverse blend of organic protein sources, vitamins and minerals developed specifically for malolactic bacteria. Only 5g/hL needed. Custom order 250 g Complex of gallotannins, ellagitannins and condensed tannins. Tannin complex specially formulated to improve and maintain the aromatic freshness of wines. Oenotannin Initial 500g Pure grape seed tannins. Vinification and aging for red wines. Oenotannin Mixte MG 1 Kg Pure chestnut tannin. Vinification and fining of white, red and rosé wines. Oenotannin Oenogal 1 Kg Alcohol extracted gallo tannins. To improve clarification and removes superfluous proteins of white, rosé and red wines. Oenotannin Perfect 500g Pure grape seed tannins. Aging. Running off and the end of alcoholic fermentation for white, red and rosé wines. Oenotannin Velvet 500g Pure grape seed tannins. Aging of white, red and rosé wines. Oenotannin VB Touch 500g Tannins extracted from oak staves Aging of white, red and rosé wines. Subliwhite 1 Kg Proanthocyanic and gallic tannins. Clarification stabilization and balance of white wines. Oenoquercus BF 10 Kg Fresh oak chips (untested). Vinification (alcoholic fermentation). Microstaves Harmony US 10 Kg American oak microstaves of a very slow toast. Woody, finesse, roundness, mocha. Microstaves Sweety US 10 Kg French oak microstaves of medium toast. Sweet, vanilla, mocha. Ministaves Sweety FR 10 Kg French oak ministaves of medium toast. Sweet, vanilla, mocha. Kit Barrique Sweety FR 24 ministaves French oak ministaves of medium toast. Sweet, vanilla, mocha. Equals to 25% of a new barrel. Ascorbic acid 1 Kg Ascorbic acid. Antioxidant. Efferbaktol 2G et 5G 500 g Effervescent granules of Potassium Metabisulfite. Must and wines sulphiting optimized for barrels and small containers. 25 Kg Potassium Metabisulfite (powder). Sulphiting. Pasteuril 500g Potassium Metabisulfite and tannins. Conservative wines and ciders. 1 Kg Ascorbic acid and citric acid. Wine stabilization against iron casse and oxidation. 25 Kg Potassium Sorbate. Antifungal. Sulfur discs 5g 1 Kg Sulfur Dioxide (gas). Sanitizing barrels. Custom order 20 L Ammonium Bisulfite solution (concentration: 200 or 400g/L SO2). Must sulphiting and fermentation activation. Custom order 20 L Ammonium Bisulfite solution (concentration: 400g/L SO2). Must sulphiting and fermentation activation. 5 L Food grade gelatine solution. Gentle clarification of red wines aged in barrels or rich in polyphenols. Custom order 250 g Isinglass. Fining agent specific to white wines. 20 L Gelatin solution. 80% of its proteins have a molecular weight over 80 000 daltons. Gentle smoothing-out of the tannin character. Flotation. Custom order 1 Kg Solvable powdered gelatin. 80% of its proteins have a molecular weight of 15 000 daltons. Used to fine tannic red wines. It removes astringency and bitterness. 20 L Silica-gel. Fining adjuvant. Oenotannin Mixte MG 1 Kg Purified extract of micro-granulated tannin. Vinification and fining process. New! 500 g Yeast protein extract. For gentle wine fining. Brand new way of fining. New! 1 Kg Pea proteins selected. Clarification and oxidation treatment of must. 5 Kg Pea proteins selected. Fining and refining of wines. Subliwhite 1 Kg Proanthocyanic and gallic tannins. Combination of grape tannin specifically developed for clarification stabilization and balance of white wines. 25 Kg Activated calcic bentonites. Elimination of unstable proteins in musts and wines. Custom order 5 Kg Bentonite, pea proteins (non GMO, non-allergenic). Preventive treatment of white and rosé musts against oxidation and protein instability. Optima 1 Kg Bentonite and PVPP. Clarifying, stabilizer. Polishing white and rosé wine. Softens bitterness in white, rosé and red wines. 5 Kg High-quality activated sodium bentonite. Protein stabilization. Removal of unstable colouring matter. Destaining of musts and white wines. Kordofan Gum 5 L Arabic gum solution derived from Acacia Verek and SO2. Prevents cloudiness and colloidal deposits. 20 L Ultra-filtered arabic gum based solution derived from Acacia Seyal and SO2. Prevents cloudiness and colloidal deposits. Instant Gum 1 Kg Powdered gum arabic obtained from Acacia verek. Prevents cloudiness and colloidal deposits. 5 L Cellulose gum (Carboxymethylcellulose). Stabilizer to prevent the precipitation of tartrates. 25 Kg Citric acid. Prevents iron casse in white and rosé wines. 25 Kg Citric acid. Acidification of wines before starting. Prevent hazes for white and rosé wines. 25 Kg Malic acid. 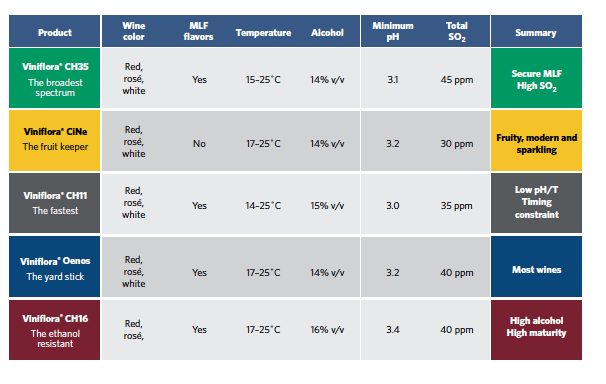 Acidification of musts or wines. It brings freshness to the wine. 25 Kg Tartaric acid. Acidification, postage tanks. 25 Kg Potassium Bicarbonate. De-acidification. 25 Kg Calcium carbonate. De-acidification. Desacid 5 Kg Precipitated calcium carbonate. De-acidification by the “double-salt” method. Custom order 5 Kg Oenological charcoal of plant origin. Destaining white musts and wine. Custom order 15 Kg Formula on measure (pre-order only). Balanced wine de-acidification through formation of double salt. 5 Kg PVPP, microcrystalline cellulose, ligand. Adsorbs the oxidizable and oxidized tannins, removes bitter and harsh flavors and prepares the clarification of wines. PVPP 1 Kg Pure PVPP (pharmaceutical grade). It prevents or cures the oxidation in white juices or wines. 10 Kg Food grade oenological activated carbon. Decontamination of musts and wines Removes Ochratoxin A and geosmin. 15 Kg Decolourizing charcoal, bentonite. Superactivated decolourizing charcoal in granular form. Potassium bitartrate 25 Kg Potassium Bitartrate. Cream of Tartar which favours tartaric precipitations during cold stabilization. Mercaptol 1 L Copper Sulfate. Curative treatment of reduction problems. Activateur Boland 1 Kg Diammonium phosphate and thiamin. Yeast nutrients for the second alcoholic fermentation. Activateur S 1 Kg Thiamin and Ammonium sulfate. This nutrient provides the growth factors and nitrogen needed by the yeast during fermentation. New! 1 Kg Natural sodium-montmorillonites. Riddling additive especially for traditional riddling on racks. Boltane P Export 1 Kg Preparation of powdered ellagic tannins. In association with riddling additive, it eases the riddling while giving more compact sediments. Custom order 1 L Preparation of liquid ellagic tannins. In association with riddling additive, it eases the riddling while giving more compact sediments. Bentonite and potassium alginate. Riddling additive. La Marquise 500 g Saccharomyces cerevisiae galactose. The right choice for sparkling. BW 200 20 L Highly concentrated liquid Alkaline. Removes tartar build-up and grease stains on stainless steel tanks and filtering equipment. Iriafut 1 L Chlorine free product. Casks restorer, disinfectant and bactericidal for all wooden equipment. MANOGEL 4 L Gel/Hand soap Antibacterial hand gel. Non-irritating, evaporates instantly leaving hands soft and smooth, with no residual medicinal scent. PEROX II 20 L Cleaning enhancer for vinery materials An oxygen bleach specifically formulated to remove stubborn dirt. Provinhy 3D 22 L Liquid Alkaline (Di Laurylamine). Multipurpose cleaning tool (ground, walls and all winery equipment).